Michael Augoustidis, AIA, of JMT Architecture’s Cleveland Studio was nominated and appointed to the Euclid Corridor Design Review Committee in September. The Committee reviews and approves all new construction projects and renovations of existing buildings along the Euclid Corridor in downtown Cleveland before projects proceed to the Cleveland City Landmarks Commission. Augoustidis brings to the Committee his experience in both architectural and interior design, including the specific demands of renovating historic structures. 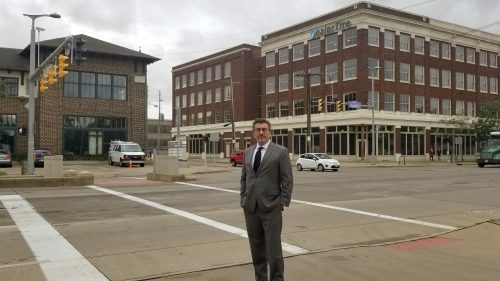 He also brings to the group an extensive knowledge of the Historic Tax Credits, which will be important to consider for many of the buildings in the Euclid Corridor. Augoustidis understands the rich heritage of the Euclid Corridor as he was the Architect of Record for the renovation of two historic buildings in the Corridor: The Baker Building and the Victory Building (The Arts Building), both listed on the National Register of Historic Places. The Committee meets privately twice a month to review all proposed new build and renovation projects. The Committee – made up of developers, other architects, design professionals, and local community members – then passes their decisions and recommendations on to the Landmarks Commission. The Landmarks Commission reads the Committee’s decisions for the record in bi-monthly open meetings when they review all proposed Corridor projects. “I look forward to working with my fellow committee members and interacting with the community,” states Augoustidis as he considers the next Committee meeting set for Oct. 4.